Emerson Electric Wine Opener, not a brand I know of, neither was I the least bit interested in studying its history. 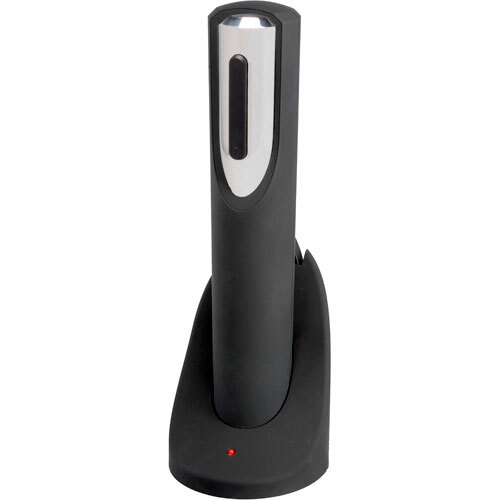 This electronic wine opener looks rather fancy, the plastic is matte and not the cheap semi gloss type but nevertheless it is still plastic. It has a metal face in front, the first time I saw it I expected the black line it had to be a display, but it’s just a button. The feel is rather similar to other electric openers, the price is not something you will think twice about, but I was going over the Emerson Electric Wine Opener more than twice, mainly because I am not a fan of electronic wine openers, but in the end I got one anyway, for the sake of giving something a chance before I condemn it to worthlessness. I used it to open a bottle of red wine which I have kept in my cellar for not too long, probably 4 years; I am unsure why I never got to opening it though (it’s nothing expensive). As usual there was no cord and it charges on its base, nothing special about that considering the day and age we live in. a simple function of placing the wine bottle into the opening and pressing the button, and so the cork came out, but bits and pieces of the cork were still in the opening, this could lead to a broken opener. After a few more weeks and a few more bottles, I came to a verdict that this was too troublesome to use as bits of cork continually found their way into the far end of the opener, this proved too hard to remove. Although it is easy to use and it sports a very nice design (wish it would have some sort of glow to add to the looks), this Emerson Electric Wine Opener is just begging to break, in time without proper caution and maintenance it will fail, I give this model a week of constant usage before the unattended bits of cork jam and destroy it, and please do not gift it.